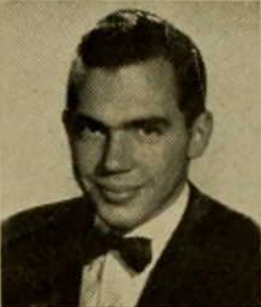 Southern Campus Yearbook, UCLA, 1943. Carlton Appleby was born in Iowa in 1923. He moved to Ontario, California with his parents and younger brother, where his father Frank Bell Appleby bought a small daily newspaper called “The Daily Report.” Following Frank’s death in 1936, Mrs. Jerene Appleby took over her late husband’s position, re-married to prominent architect Jay Dewey Harnish, and set about expanding The Daily Report – her gift for the printed word resulted in numerous awards and accolades. Her sons, Carlton and Andrew, attended the prestigious Webb School for Boys; Carlton began working as an office clerk to gain real-world work experience. Like many college-bound men of his time, Appleby chose to join the Marine Corps and take advantage of the Navy V-12 program, which allowed students to complete their degrees before reporting for officer training. Though he was officially a Marine private, Appleby attended college classes at UCLA’s South Campus until the summer of 1944. The college life came to an abrupt end as Appleby went through his requisite boot training at Parris Island; he must have been glad to return to a more familiar atmosphere in the classrooms of Quantico’s Officer Candidate School. By April 1945, Appleby had his commission as a second lieutenant. He was assigned to Company B, First Battalion, 24th Marines as a platoon leader, and began training in earnest for the invasion of Japan. However, the war ended before he saw any combat. Lieutenant Appleby served with reserve units in California through the end of 1946; he was recalled to active duty in 1951 to serve as a platoon leader with 1/7th Marines, then deployed to Korea. Returning safely from his second overseas deployment, Appleby was placed on inactive status and settled comfortably into civilian life. He joined his mother Jerene Harnish (by now a notable figure in newspaper, radio, California politics and education) in the publishing business, eventually becoming the president and publisher of the Escondido Times-Advocate. Carlton Appleby died of lung cancer on December 14, 2015.